Today, on the 15th anniversary of 9/11, I am posting the memorial I wrote on the 10 year anniversary with updates on a surreal encounter and a promise kept. Her message was my wake-up call. She inspired me and changed my life forever. Yet I never met her. 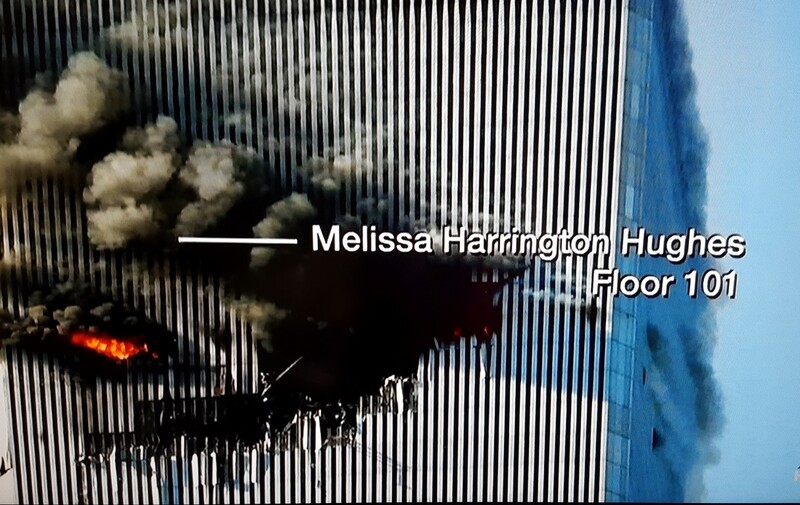 Melissa Harrington Hughes died at the World Trade Center on September 11, 2001. She didn’t work there; she was on a business trip for her San Francisco-based technology firm. She was an extremely accomplished 31-year-old, who had traveled the world and had been married her sweetheart, Sean Hughes, for the past year. The first time I heard Melissa’s voicemail, Sean was speaking to Chris Jansing on MSNBC and played the recording on air. Ms. Jansing completely broke down upon hearing it. Clearly, Melissa’s final words resonated with a lot of people. The internet site dedicated to Melissa filled with posts from people who were touched by her story. I was among them. When the buildings collapsed I thought about all of the people that worked for my company in those towers. Three of our employees died that day but Melissa was the one that stood out. Somehow, amongst the overwhelming tales of tragedy, her story elicited the strongest emotions from me. But why? I suppose that, in part, I could relate to her on some level. I was also employed by a large Bay Area-based firm and had spent most of my adult life working in San Francisco. At one point I made several business trips to NYC to meet with staff housed in the North tower at the World Trade Center. I remember navigating the unusual elevator and escalator systems in that building as I rushed to early morning meetings, just as she must have done. I was also struck by Melissa’s beautiful wedding picture taken up in Napa, California, close to where I grew up. I knew that she had appreciated what a special part of the country that is. But it was more than the similar business trips and her picture that stayed with me; it was her voicemail to Sean that was seared into my brain. In her voice I could sense so many of her emotions: fear, panic, bewilderment. But mostly, in her final minutes on earth, she wanted Sean to know that she loved him. I thought about her, and all of the people that died that day, who went off to work as they normally did. Kissing a spouse or child good-bye, grabbing a cup of coffee, making plans for the weekend ahead. And none of them came home. Plans and hopes and dreams were gone in an instant. Sean Hughes said that he and Melissa were excited about their future and talked about all the things that newlyweds do: moving to a new home, getting a dog, having children. The weeks following September 11 were frightening and incredibly busy for me. My division of the company had locations throughout the United States and for weeks after the twin towers fell we received bomb threats in our major office buildings. Of course, all of them were false but that didn’t lessen the hysteria of my employees who were in those buildings. I understood – my office was on the top floor of our Los Angeles headquarters and I jumped every time I heard a plane or helicopter go by. After a month or so, I began to hope that the turmoil would pass and that my life would get back to “normal”. But then I thought about Melissa. Life doesn’t get scripted. I knew that the odds of being killed in a terrorist attack might be low, but there were no guarantees that I could escape a car accident or a terminal illness. So the first week of November, after the initial frenzy had died down, I told my boss that I wanted to resign. We negotiated that I would stay until March 1, which I did. I have never regretted that decision and would not trade all of the memories and experiences I’ve had since then for any amount of compensation I gave up. The author Judith Viorst once wrote that it is the small moments in life that make it rich. Melissa made me realize that I needed to grab the small moments while I could; that sitting with my husband every morning, sipping coffee and watching the news, is a gift not to be squandered or go unappreciated. So to Melissa Harrington Hughes: thank you. Someday I hope to get back to the new September 11 Memorial where I will touch the steel engraving of your name. And in the hollows of those letters, we will finally be connected. 2016 Update: This past March I went to New York with my niece and her two daughters. Visiting the National September 11 Memorial and Museum was one of our highlights (I wrote about it in The Museum of Sadness and Strength post). I read that buying tickets in advance was key so on February 24 I went on to their website to order ours. On that same day I received an email that someone had commented on my original post about Melissa. I thought that was a coincidence – that maybe something that I had typed in the computer had caused an old comment to be recirculated. But it wasn’t an old comment – it was this: “I came across your blog after my son and I just prepared an required oral presentation for his English class about a life event of mine that had great impact. I think of Melissa almost every day – I was her best friend since childhood. She was a shining light and people were drawn to her. I miss her and the memories are still clear with detail. Thank you for seeing how her passion, love for life, and love for her husband and family was that shining light, even if it was her last words. She called her Dad and Mom and Sean from that burning building because she loved them deeply. She is well remembered and will never be forgotten.” I still get chills when I read this note and think about the timing of it. There are no coincidences in life, of that I am sure. On March 30 I was finally able to fulfill the promise to myself that I would visit Melissa’s engraving at the Memorial. 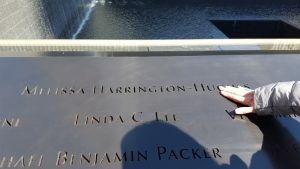 Her name is carved into Panel N-22 on the large reflecting pool that stands in the footprint of the former North Tower. I put my hand on her name and thanked her once again for all that she has meant in my life. May she rest in peace.